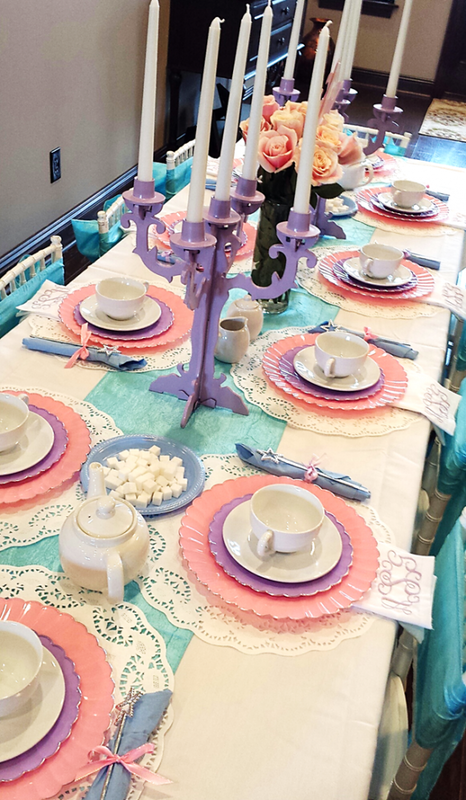 If you are a follower of our blog or just have a love for pretty things, you might remember a little girl’s birthday party that we did a post on last year. The theme was an Under the Sea Birthday Party and to date, the Ariel birthday cake is still our highest pinned item on Pinterest. With summer just around the corner, this is a fun birthday party theme for pool parties or beach excursions. This year, my very creative friend did not disappoint for Annabelle’s third birthday party. For the birthday parties that she hosts, every detail is meticulously scrutinized. I’m always in awe at what a fantastic job she does at pulling it all together. What makes this year different from last year is that it’s Annabelle’s last birthday as an only sibling. My sweet friend will soon be a mommy-to-two as another little girl makes her way into this world. I’m not sure how Annabelle is taking it, but for this day, she got to be the only head princess of the house. Luckily, she is a big fan of the movie Frozen (what little girl isn’t?) so maybe a little sister is exactly what she is hoping for. 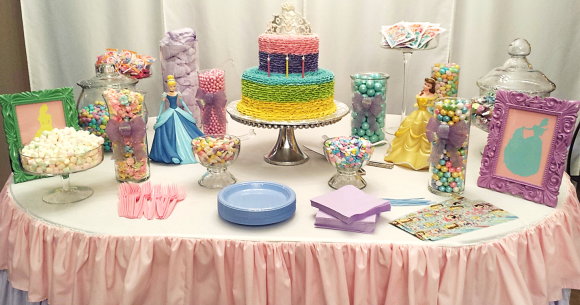 For this birthday party, the theme still revolved around princesses, but included all of the Disney favorites instead of just the one who lived in the sea. 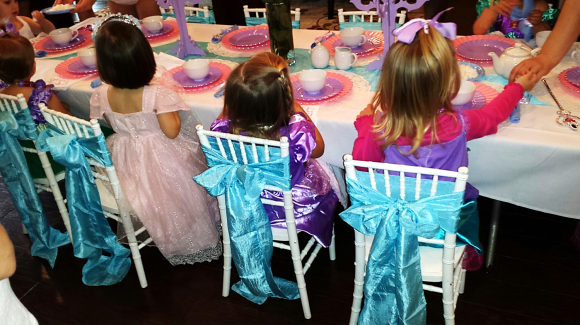 The invitation to this princess tea party requested that all little girls come dressed as their favorite princess. To my surprise, not one came out of costume. 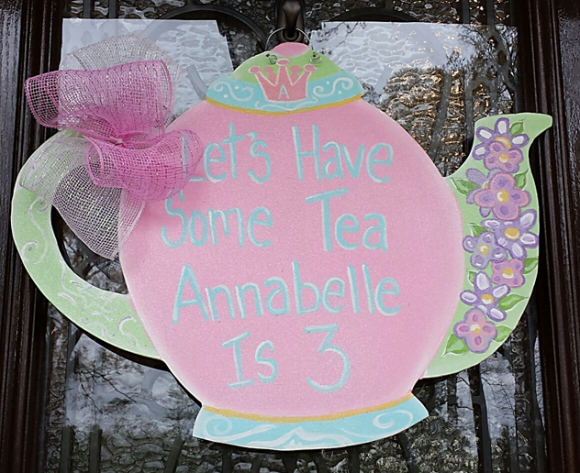 A hand-painted wooden teapot sign welcomed the guests to Annabelle’s soiree. In the foyer was a long table filled with pinks, purples, and blues. A linen tablecloth and blue runner made the base of the table. 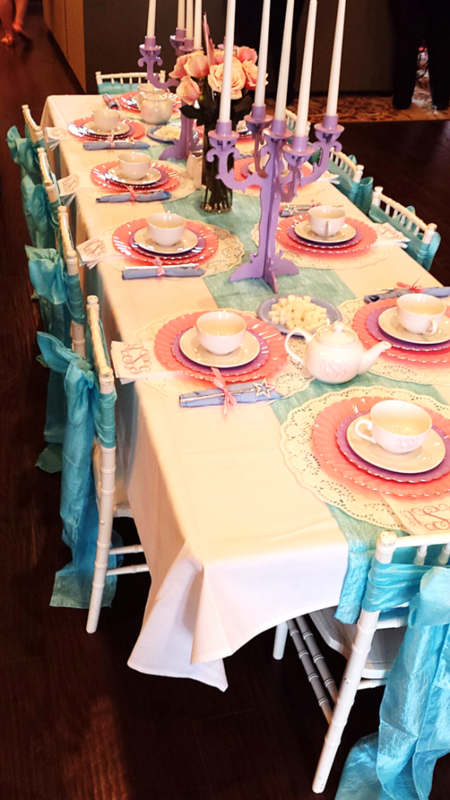 Ten small white chiavari chairs were placed at each place setting with a blue sash tied to the back. 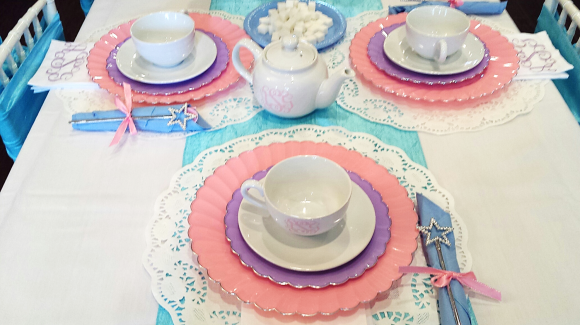 Large lace doilies were used as chargers and pink, purple, and white plates were layered on top. The centerpiece included two purple candelabras on each side with pink roses in the center. What’s a tea party without a tea set? Each place setting also included a monogrammed tea-cup with a monogrammed napkin and let’s not forget the sparkly wand. Two monogrammed tea pots were displayed on each side of the table with sugar cubes available for the taking. It was a table fit for any princess. 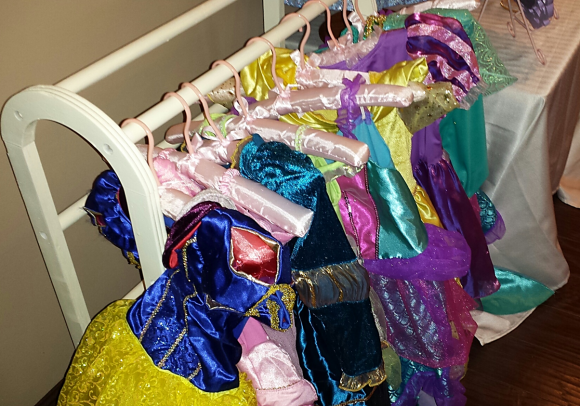 If any of the little princesses had forgotten their gowns or crowns, no worries here. 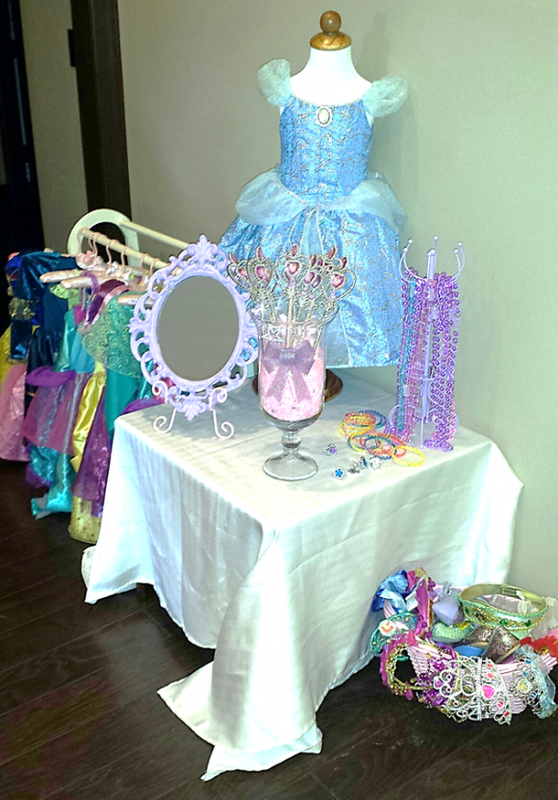 To the right of the table was a dress-up area filled with all of the favorite Disney princess dresses and tiaras. 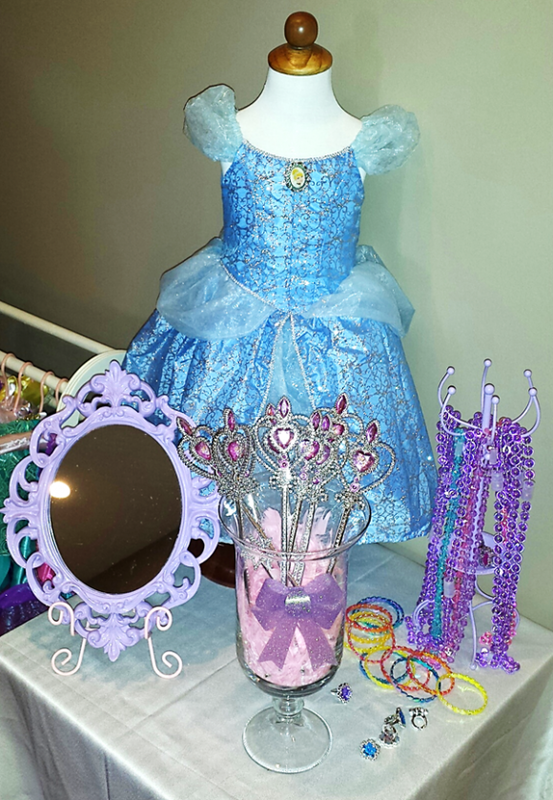 The mantle was colorfully decorated with a princess dress name banner, purple wired carriage, and framed outlines of princesses. 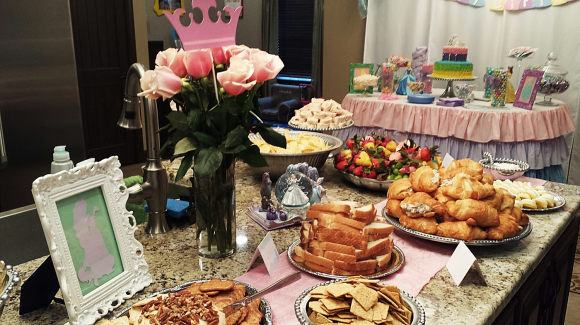 The food table consisted of tea sandwiches, crackers and dips, fresh fruit, and cookies galore. More pink roses graced the tabletop and another framed outline of one of the princesses. 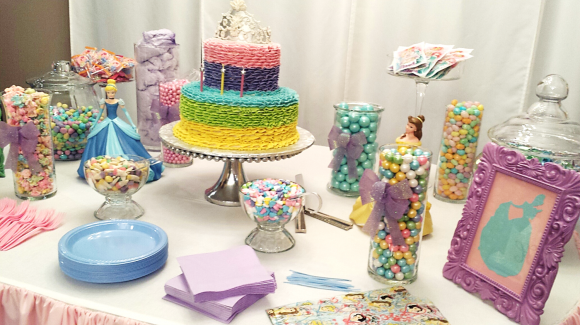 Along with the princess tea-table, perhaps one of the most stunning areas was the cake and candy buffet table. If you have one candy buffet at an event, it makes it easy to bring this fun addition to all of your future parties. The different sized candy jars were filled with pastel colored candies and tied with bows. 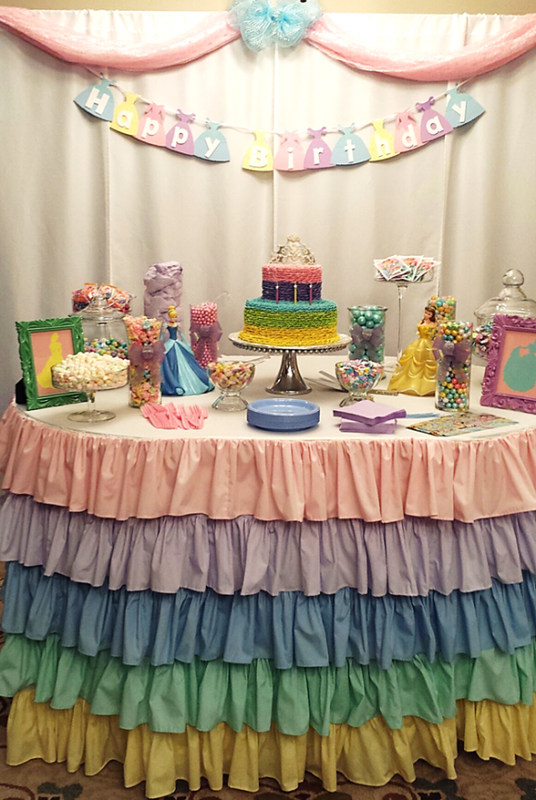 The pink, purple, blue, green, and yellow table skirting was sewed by my friend’s aunt (who is an absolutely amazing seamstress). The princess birthday cake was colorfully skirted as well and topped with a princess crown. 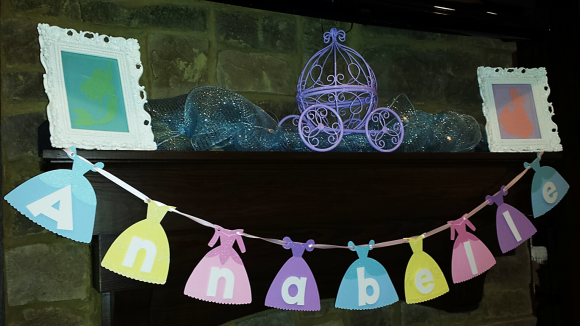 Another princess dress banner was hung above the table with HAPPY BIRTHDAY spelled out. To tie it all together, a white linen backdrop was hung with pink sheer fabric gracefully draped and a blue bow to top it all off. There is no doubt that it takes a lot of time, work, and resources to pull off a successful party – big or small. What makes it all worth it? The love and joy showered on the guest of honor.